Welcome to the Dawn of Demise BBS. 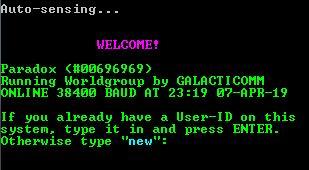 This BBS is running MajorBBS v6.25-256 and is my tribute to the old days of electronic bulletin board systems. It includes many classic door games popular to MajorBBS. Philadelphia’s friendliest BBS! Online continuously since April 1987! One of the first BBSes in the world to run MajorBBS software. Featured in several publications. Voted to Boardwatch’s top 100 BBS list. BBS is dedicated to Swords of Chaos and it’s active player community. We have replicated the old Seabreeze mods and are the most active SoC game on the net!